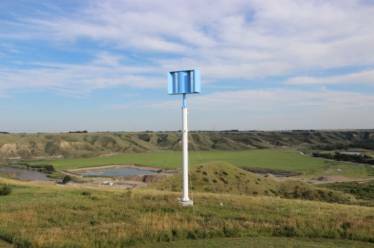 During the summer of 2010, Portland Bolt was contacted to be a supplier for the installation of a series of custom wind towers in Alberta, Canada. Portland Bolt was responsible for the fabrication and galvanization of not only the large nonstandard F1554 Grade 55 bent anchor bolts, but also for the galvanized clevises and tie rod assemblies that brace the wind towers. The brace rods ranged in length from 142” – 156” long and are 1” in diameter. The rods were assembled with a right hand threaded #3 clevis on each end and turnbuckle in the center of the assembly. The clevises had a custom 15/16” diameter pin that fit into the customer’s designed connection and were shipped in a special configuration to ensure the correct rods where assembled together on site on the correct tower. The project consisted of multiple wind towers with 16 large 1-1/4” diameter and 69” long anchor bolts in each foundation. The right angle bent anchor bolts and rods were both hot-dip galvanized in-house with our own hot-dip galvanizing line. Portland Bolt was able to work with the customer to meet their design requirements, facilitate shipment over the border into Canada, and provide certifications and submittal drawings, while still meeting the construction schedule required by the customer.